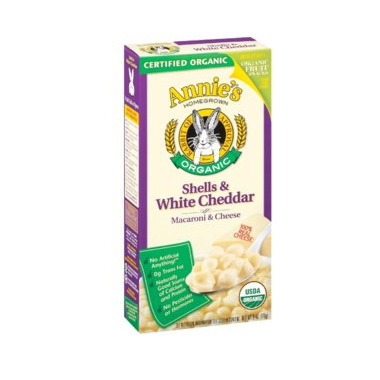 Annie's has created Organic Shells & White Cheddar. Made just like our original Shells & White Cheddar, but with real Organic white cheddar cheese and Organic pasta. Ingredients: ORGANIC WHEAT SHELL PASTA, ORGANIC VALLEY ORGANIC CHEDDAR CHEESE (ORGANIC CULTURED PASTEURIZED MILK, SALT, NON-ANIMAL ENZYMES), ORGANIC WHEY, SALT, NATURAL SODIUM PHOSPHATE. I have loved this mac and cheese for years, but just tried making it with yogourt (a suggestion on the box) for the first time and love it even more! Delicious! My kids and I loved it. This will be in my pantry for those busy nights when I have to throw something together quick. My kid likes this pasta. The taste is great. I like that it is organic. My son loves Annie's Mac & Cheese and I think it is pretty tasty too! I feel better about serving him Annie's products then other brands as I know the ingredients are better for him than most. My daughter loves these and I like that they are organic and easy to make. Very tasty and great quality! Tastes great! We like this white cheddar more than any brand we've tried and love that it's organic! Annie's tastes great, always a favourite in my house.